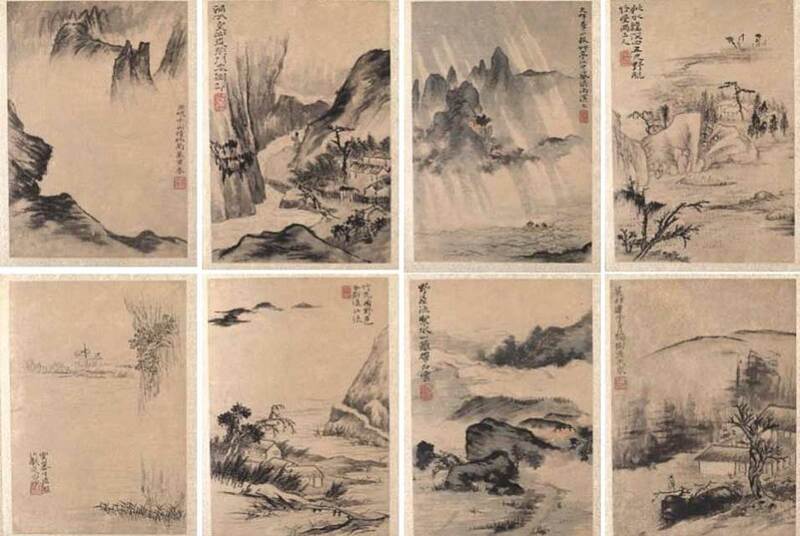 Landscapes Inspired by Du Fus Poetic Sensibilities valued at HK$120 million/US$15.5 million. Photo: Christie's Images Ltd 2010. HONG KONG.- A masterpiece valued at HK$120 million/US$15,480,000 by Ming Dynasty Chinese classical painting master Shitao (石涛) (16421707) will be offered by leading international auction house Christies at its Hong Kong Spring Sales on May 28th. Shitao, a renowned scholar-artist, was one of the most influential painters of his time and had a profound effect on the artistic development of subsequent Chinese ink and brush artists, including early 20th century masters such as Zhang Daqian (张大千) and Fu Baoshi (傅抱石). This exceptional album of 8 leaves, ink and colour on paper, entitled Landscapes Inspired by Du Fus Poetic Sensibilities and estimated at HK$120 million/US$15,480,000, is the most valuable Chinese painting ever to be presented at auction in Hong Kong. This work is among a group of over 400 rare and exceptional Chinese paintings and calligraphy works valued in total over HK$350 million (US$45 million), to be offered at Christie's Hong Kong 2010 Spring sales. Landscapes Inspired by Du Fus Poetic Sensibilities, created in the later years of Shitaos life, was re-mounted in 1815 (Qing Dynasty) and was inscribed master craftsman Huang Xuepi ( 黄学圮). In 1891, the work was acquired by the famous late Qing Dynasty painter Gao Yongzhi (高邕之) in Shanghai, who later recorded this painting in his book 《泰山残石楼藏画》. This painting was also published in the U.S.A, Japan, Tai Wan and China. The subject matter of this album is an ode to the poetic beauty of famous Chinese ancient poet Du Fu (杜甫). Du Fu, who was adept at ancient-style poems, often used metaphors of landscape to describe his anxiety about the rise and fall of the Tang Dynasty. Striking a chord with his sentiments about his own life and times, Shitao expressed his underlying emotions through his paintings of landscapes, using his unique style that gives free reign to artistic freedom but within the confines of the traditional subject matter of landscape and nature. Even as far back as the late Qing period, Shitao's works have been in extremely high demand among collectors and personalities of high social standing, including such famous painters and calligraphers as Gao Yongzhi (高邕之), Luo Zhenyu (罗振玉), Chen Banding (陈半丁), and Huang Binhong (黄宾虹). Noted Shanghainese real estate tycoon Cheng Linsheng (程霖生) in the mid 20th century even had a separate exhibition room called the "Shitao Studio" so as to accommodate all the exquisite Shitao works he had collected at the time. Christie's Hong Kong is greatly honored to present this exquisite landscape masterpiece for the first time ever at auction, offering worldwide collectors the chance of a lifetime. The social upheavals of the early Qing dynasty greatly impacted the Ming court and literati, forcing them to make a painful choice between surrendering to the Qing court or preserving their moral integrity by resisting the invaders, though both choices would be a serious threat to their lives. Undergoing this spiritual pain, scholars and artists expressed their predicament in distinctive ways through their paintings and calligraphy. The famous Four Monks of Late Ming consequently emerged as a representative group. Four monks sequestered themselves from the earthly world and converted to Buddhism, devoting their whole lives to the study of the arts. Due to the personal experiences of each of the four monks, their art presents varied perspectives on their plight. Among the four, Shitao (石涛) and Ba Da Shan Ren (八大山人) (Zhu Da) were both born into royal Ming families; but while Ba Da Shan Ren was detached and aloof, expressing his loneliness and solitude throughout his works, Shitao actively devoted himself to an earthly existence  first adopting Buddhism and later converting to Daoism. With great warmth and humanity, he paints with a richness, delicacy and creativity that was beyond his time. In his book "Art Theory" (《画语录》), Shitao gave a clear explanation of his individualistic painting theory, from creative motivation, to technical aspects such as movement of the wrist to produce different brushstroke and impressionistic effects, to the medium - water and ink  to depict mountains, oceans and rivers, the forests and the atmosphere. All of this can be seen in Shitaos brilliant paintings which perfectly fuse realism and freestyle strokes. In the late Qing period, as visionary artists started to pursue breakthroughs especially in art, many artists started to draw on the artistic philosophy of the ancient masters. Shitaos unique style of unrestrained brushstrokes and innovative technique with washes and evocative brushstrokes brought a refreshing perspective and was broadly and eagerly pursued by many modern artists in different ways and from different angles. When renowned modern Chinese painter Fu Ruilin (Fu Baoshi) (傅抱石) studied Shitaos texts on painting theory, he became so inspired by the artist that he changed his name to Bao Shi, literally embracing Shi in honour of this great artist. He henceforth went on to seek a new creative direction in his art and developed a unique style drawing on the techniques of Shitao, culminating in what is now referred to as Bao Shi Wrinkle Style. Zhang Daqian (张大千), was also greatly influenced by Shitao. Indeed, his early works greatly imitated those of Shitao, while his later works, though clearly still greatly influenced by Shitao, gradually evolved to be a classical style unique to the artist.